One of my favorite things in the world to do is to go grocery shopping. Probably not much of a surprise seeing as how I’m obsessed with food and all but whatever, it’s my favsies. I always try to go for groceries at LEAST once a week because there are always sweet new weekly bargains to be had and it’s a nice excuse to get off campus. I generally buy my proteins and dry staples at Safeway and I’m always pleased to see what they’ve got up for grabs. 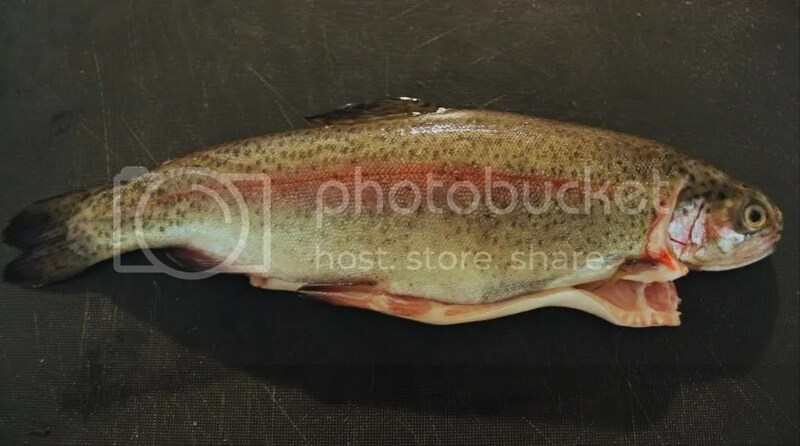 This summer I scored a huge pork shoulder for $11, I’ve landed plenty of cheap chicken and beef, and THIS week I scored two whole trout for five dollars!!!! So yeah, I bought the trout, went home, put them in my fridge, and smiled a lot about it…then realized I’d never cooked a full fish of any kind before. I’ve eaten full fish before at Chinese restaurants and once during a camping trip BUT I’d never had any hand in making them. I thought about it for a while, took out one of my trout, stared at it, and turned to the interweb. So, thank you internet and thank you black bean sauce for making me a delicious fish. I named him Franz…then ate him. Lucky for me, it turned out that cooking whole fish is super easy. All you gotta do is give it a good clean, dry it off, and smack on some seasoning. I stuffed mine with sliced garlic and fresh ginger, made some deep cuts into the skin on the sides to help it absorb sauce, and rubbed on some black bean sauce. Easy peasy so far. After stuffing and rubbing the fish, I let it sit for about 20 minutes to absorb some flavor. Once the oven was preheated I mixed some soy sauce, chinese cooking wine, and rice wine vinegar and poured it over my fish. Also figured I should have some veggies with my fish so I threw in mushrooms, zucchini, carrots, and more garlic and ginger cause you really can never have too much of those guys. Once everything was all mixed and looking good I threw it into the oven, covered with tin foil, for about ten minutes. After it had steamed a bit, I took off the foil, let it cook for five more minutes, then puled it. Of course, once it came down to eating time I was a bit confused again BUT after haphazzardly filleting my fishy, I got two nice fillets, a few fish bones, and a damn tasty dinner. 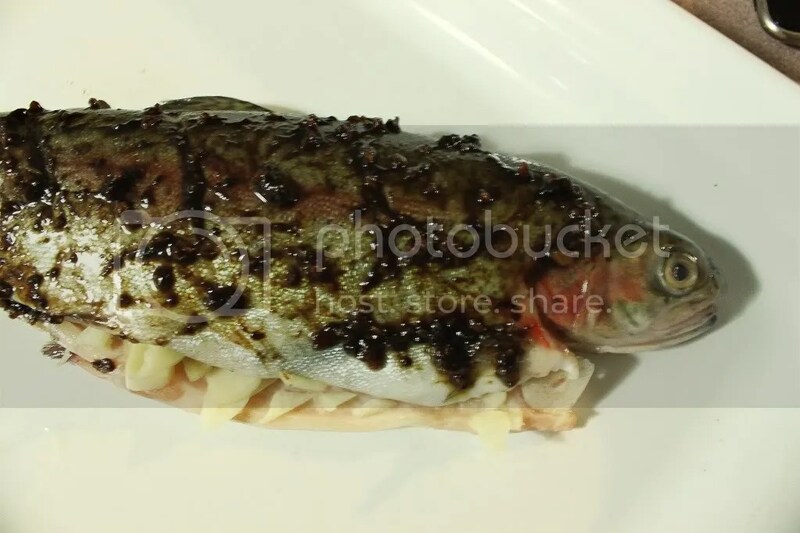 The fish was flaky but moist, the skin was a bit crunchy, and the sauce was present but not too overpowering. All in all it was a success! Franz all baked up and ready to get into my belly. I ate mine over rice, of course, and it was positively delightful. Trout is great because it’s not too ‘fishy’ like some fish can be, i.e. mackerel which is fishy like WOAH. So yeah, this fish was delish BUT I think the best part might have been the post dinner photo shoot. 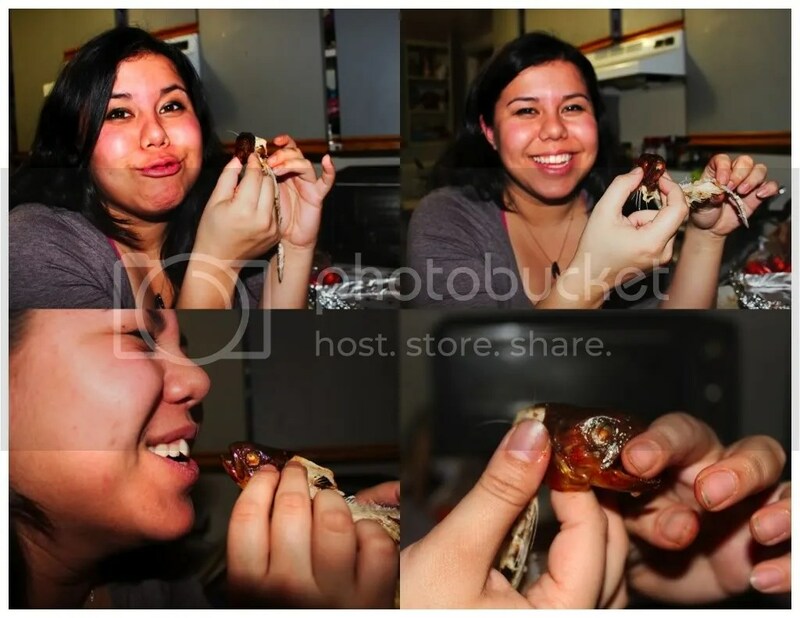 Nothing says fun loving like pictures with a fish skeleton! Wash the fish thoroughly, inside and out and then pat dry with a clean towel. Cut deep diagonal slashes into the side of the fish, exposing the flesh but not the bones. Stir together the black bean sauce and the sugar. Put the fish in an oven safe pan or plate with high sides. 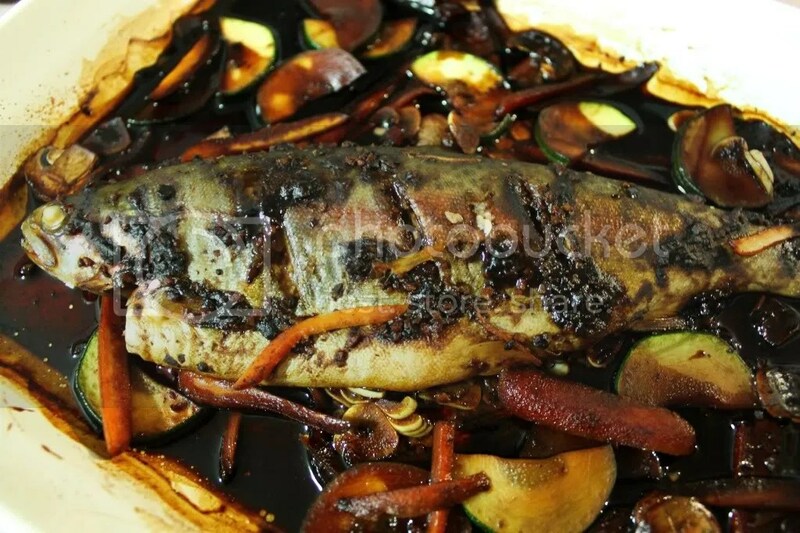 Place 1/2 of the sliced garlic and ginger inside of the fish, spreading evenly and then rub half of the black bean and sugar sauce over fish. Turn fish over and rub on the rest of the black bean sauce, making sure the sauce is getting into the diagonal slices. Cover with plastic and let fish sit for about 20 minutes. Heat oven to 350º. 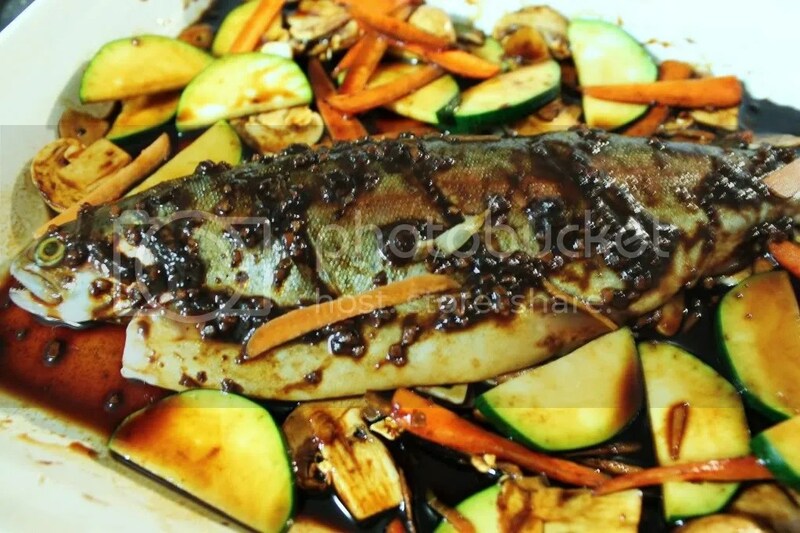 Mix soy sauce, cooking wine, vinegar, remaining ginger and garlic, and oil and pour over the fish. If cooking vegetables with fish, place in the dish now. Cover dish with tin foil and bake for 10 minutes. Remove foil and cook for another 5-10 minutes, or until flesh is flaky and opaque. Oh I love trout..my hubby brings home so many over summer..I love the way you made yours, very delicious!! !